Origami Yoda had other plans. That’s when I noticed it in the glass doors’ reflection: six students approaching me from behind, eyes fixated on mine and plastic lightsabers clipped to their belts. They didn’t look too happy. I recognized him as one of the Bounty Hunters, Jim. His friends, though, were all pretty intelligent and popular students in the school. Max, Helen, Carol, etc… even Ben. “You’ll pay for all the damage you caused to the school, Tommy.” Ben pulled out a modified version of his EZ Darth Paper. The other students pulled out puppets of their own. “The Knights of Ren.” I blurted out. So, uhh… We have a big problem. I was SUPPOSED to be daydreaming about my super-fancy-pants-richy-rich Walt Disney’s School For Gifted Artists, but instead, I get approached by a fellow student in a dark hoodie wielding an origami Dark Sider. Why does this always happen? And the worst part is that my new recording thingy barely works at all and sometimes doesn’t punctuate things the way it should and it doesn’t make new paragraphs and sometimes it even puts down the wrong monkeys from what I’m trying to say! (Gah! I said WORDS!) Anyhow, the Dark Side loser (he calls himself “Supreme Liter Coke,” oh brother) puts me in a headlock and takes me over to the guys’ bathroom. He looks under the stalls to see if anybody is inside, then shoves me face-first into a stinky, smelly, soaking-wet dinosaur. (TOILET! I said, TOILET! Urgh!) I was barely phased by the swirly, as I’d had many of those over the years, but what really bugged me was the way this hoodie guy spoke to me. He acted like he had some sort of authority over me and my friends, and I detested it. He tells me he has something to discuss with me, and now I’m waiting for him to come back, since he duct-taped me to the sink. He says he has some big secret to tell me, and an offer I can’t refuse. I don’t care what this dude says, I’m not intimidated. Oh, wait, he’s back, gotta go. Above the wall, it had a message. It said a really bad word that none of us would have used. And guess what was taped next to it? Foldy-Wan Kenobi. MY Foldy-Wan Kenobi. “May I ask who gave you this complaint?” I started reaching into my backpack for Foldy-Wan. “What?” My hand dug through the contents of my backpack. Foldy-Wan was nowhere to be found. “Your friend Kellen came clean about your so-called Bounty Hunters,” Howell said with a smirk. “You formed them with the help of Lisa. You just couldn’t stand submitting to your elders and teachers, huh? The Origami Rebellion didn’t do it for you? !” Howell slammed his fists on the table. My heart jumped. “NOW!!! !” Howell screamed, a fire in his eyes. I walked out in confusion, my heart pounding fiercely in my chest. Was this a dream? Would I have to go somewhere like CREF? It’s hard for me to admit this, but I was terrified. I remember wondering how horrible it would be for Dwight had he gone there. In my heart of hearts, I felt like that little Youngling who bumped into Vader in Revenge of the Sith. Heartbroken. Betrayed. By Kellen. “Sorry dude, you’ve been kicked off the Rebel Council.” I stared Tommy dead in the eyes. “What!? You can’t do this!! You wouldn’t!” Tommy struggled to hold in his clearly boiling anger. Silence. Only the heavy breathing of Tommy kept me from breaking out into tears. I hated every moment I continued down the dark path. If I’d ever get a chance, I would pummel the Supreme Leader into jelly for this. “So be it.” Tommy shoved past Sara a little too harshly and trudged down the hallway. Part of me hoped I’d never have to see him, or face his righteously accusing glare, again. This was all my fault. Kellen’s words echoed in my head. I’d be an outcast. Everything would be gone. Even my best friend and girlfriend, wrong as they may be, would be lost. “So be it.” I ran off to find the one person who would never give up on me. He would know what to do. “What about Origami Yoda?” Dwight asked clearly. At that moment, I realized… Dwight wasn’t mumbling. A deep sadness had rested on McQuarrie Middle School. (At the very least, I was definitely sad). It didn’t take long before my sadness gave way to anger. Today was already McQuarrie Middle School’s last day, after a series of destructive incidents ruined the school’s budget and threw people like Mr. Howell deep into debt. But now, Kellen had framed me for ALL of it. I swore that I’d clear my name and protect McQuarrie Middle School now that I was on my own. I would have revenge. It is a dark time for the Origami Rebel Council. The Supreme Leader has risen from the ashes of Tommy’s leadership and will not rest until the Force Ghost Origami Yoda has been found. We’re not even allowed to use our puppets unless it’s to hunt Yoda down, and, of course, none of us want to do that. What we did want to do was save Dwight and Tommy, but if we do, the Knights of Pen will rip our origami puppets to pieces, and something about Kellen’s behavior is telling me we’d lose another friend if we did. Tommy’s Comment: Poor Mike. I think Kellen got to him before he sent the email! Dwight’s Comment: Elementary, my dear Tommy. Had Kellen been the one to find Mike, he would have deleted all mentions of himself in the email. The perpetrator must have been a Knight of Pen. Sara’s Other Comment: Why are you guys writing down everything I’m saying? Stop it. It’s weirding me out… Tommy. TOMMY. Tommy’s Other Other Comment: Oh. Sorry, honey. The Supreme Leader usually keeps our puppets in his bag. The thing is, he carries that bag around with him everywhere! It’s only in the library that he doesn’t have it with him. He sits down to read The Montana Chronicles every afternoon at 3:00 while his knights guard the bag. We think, if we can form a small band of rebels, we could create a diversion, distract the guards, steal the origami, and return them to their owners! Me and Sara looked at each other, then Dwight, and smiled. A very nice, mysterious reintroduction into the series. Wonderful job, Mr. Creaser James! 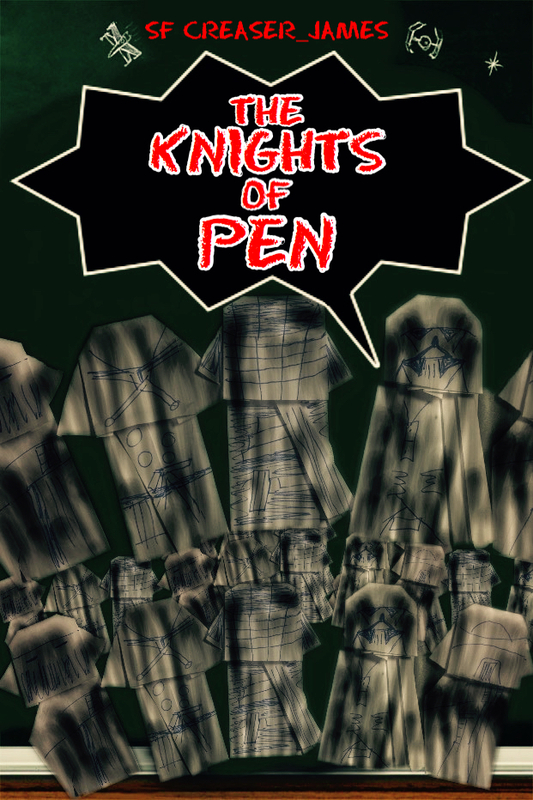 And stooky Knights of Pen! Thank you Noah! i hope everyone who is reading this story was very entertained! Interesting, good continuation. I think Dwight should’ve been weirder though. How do you fold the Knights of Pen? I’ve always wanted to fold them, but just can’t get it right. Well done Creaser James, I enjoyed that a lot! May I ask where Harvey went again? Wait, does this mean that all the origami puppets of the Rebel Council taken by the Supreme Leader were turned into Knights of Pen? Because if the poor ol’ Fortune Wookiee and good old Han Foldo were turned into Knights of Pen, my heartstrings are gonna be pulled so much I might as well die knowing that the Knights of Pen forced that cute lil’ Wookie, the Fortune Wookiee, to the dark side.